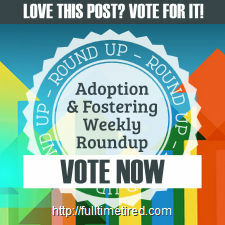 Last week’s blog explored how values influence our parenting. We focused specifically on kindness and the importance of teaching our children how to be kind to themselves and others. 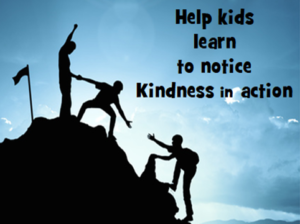 During a follow-up conversation with my daughter—who also happens to be a teacher in addition to being a step-mom—she made an important point: it’s not enough to tell our children we value kindness, we must show them with our actions. Even more importantly, our examples must include a soundtrack—an obvious and pointed voiceover that explains exactly what and why we are doing something. For example, on Halloween when we went trick-or-treating at her house, beside the bowl of candy, she also had a blue pumpkin that held “alternative” treats for kids who can’t eat candy. As an adult, I recognized this gesture as an act of kindness, an effort to be aware of and accommodate the differences between children. 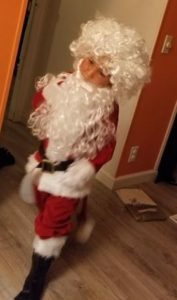 But my three-year-old grandson (and any other children who visited her house that night) might not necessarily notice or recognize the significance of this gesture. Some children can’t eat candy so Aki included treats they could enjoy. It is one way that she chooses to be kind. Our family values kindness. My grandson nodded. Point made. No need to belabor it. We left it at that and continued to enjoy Halloween festivities. The next day when we bicycled past my daughter’s house my grandson mentioned the blue pumpkin and how he’d never seen one before. Clearly, it had made an impression even in the midst of a hyper-exciting night. I had a chance to repeat an explanation of its significance and we continued on our way. Example set, observed and integrated. It is a truism that kids watch what we do and learn more from our actions than our words. But we can't always count on their noticing. They may also misconstrue what occurred. Too often we assume kids infer the accurate lesson from our examples. But life resembles a three-ring circus more than center stage. They may focus their attention elsewhere. Lost in their own world, they may be oblivious to our good example. Don’t leave it to chance. Clarify the intent behind your actions and choices. Help your children understand your thought processes and your goals. Talk about these moments so you can learn from them what they are “seeing” and what inferences they are drawing from their observations. You will gain a clearer sense of how their minds think and they will get a more accurate sense of your actions and intentions. It will also train children to notice context and behavior and to ponder what people’s motivations and purposes might be. This helps them develop a habit of awareness, and nurtures a stronger understanding of how your family puts their values into action as well as how others reveal and live theirs. 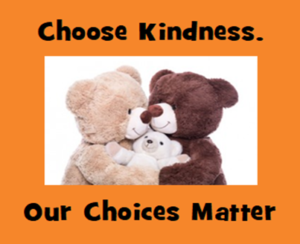 In the process of teaching our kids the value of kindness, we remind ourselves that kindness is a conscious choice. We have to look for opportunities to be kind, make the decision to be kind and then follow through on our decision. Last week during a discussion around the dinner table, my daughter’s step-daughter posed a question: As a parent, what do you think is the most important thing you can teach your children? That’s a powerful and provocative question, especially from a high school freshman. I reflected for a few minutes and then responded. I believe that kindness serves as the anchoring root of all of my values. All my other deeply held values build upon this foundation. Why kindness? Like many profound influences, kindness is simple. And, like most profound beliefs, it is not easy. Kindness operates on many levels. It begins with kindness toward self. Ironically, we often treat ourselves more harshly than anyone else. Consider the inner dialogue that plays within our brains. Too often, the things we say to ourselves are harsh, critical, judgmental, unforgiving and lacking compassion. We would not talk to friends and colleagues that way. If we did, they probably wouldn’t remain our friends for long. Yet we routinely subject ourselves to this negativity. It is essential for us to remember that we are all works in progress! Life is a Learning Conversation. When we place ourselves in that context we begin to remember that everyone else is also a work in progress. Each of us is facing challenges, shouldering burdens, searching for resources, seeking new skills, and coping as well as we can. None of us is perfect. Perfection is a myth; it is also a cruel taskmaster holding us to an impossible goal and then deriding us for falling short. As Intentional Parents we strive to think about our actions and beliefs consciously to ensure that they reflect our best intentions and authentically support our goals for self, for family and, for community. I believe one of the most powerful steps we can take on this journey of Intentional parenting is to be kind to ourselves. As this frame of mind takes root and governs our thoughts, behaviors and decisions, it influences our relationship with our children. We will strive to interact, educate, and discipline our children with kindness and love instead of impatience, harshness or cruelty. Our behavior becomes their model. Our voice becomes a through line in their inner soundtrack. We benefit from kindness to self and our families. Like the proverbial stone dropped into water, kindness ripples outward. Kindness begets kindness. Readers of my book review blog know that I search for and promote books that highlight the importance of kindness. 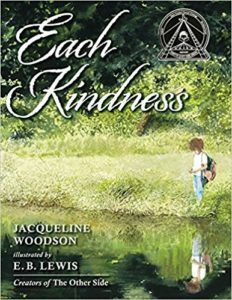 I highly recommend one memorable book, Each Kindness by Jaqueline Woodson. Although it is a picture book continues to resonate in my thoughts. Its provocative message will touch the hearts of all readers regardless of age. Each Kindness a Jane Addams Award Book by Jacqueline Woodson, also was named a 2013 Coretta Scott King Honor Book. This is truly an exceptional book. As I read it goose bumps shivered my arms. E.B. Lewis captured the deep emotion of the story in dreamy water colors. The illustrations juxtapose both beauty and heartache because they reveal the children’s lack of kindness, their unwelcoming cold shoulder and judgmental rejection of the new girl. One might assume this story replays the classic storyline of the challenge that every “new” kid faces. But it exceeds that think-how-the-shunned-kid-feels meme as the children rebuff her repeated efforts to break into their circle. Instead, it goes beyond empathy and asks the reader to imagine being the child who chose unkindness, who joined the taunting, who derided and jeered. After the teacher uses a pebble-dropped-in-water to demonstrate how one act ripples in an ever-widening circle, Chloe undergoes a change of heart. She wants to include the outcast girl. She anticipates making amends, only to discover, it is too late. The girl has moved away… Chloe has lost the chance to repair the damage done. The book ends with the words, Chloe “watched the water ripple as the sun set through the maples and the chance of a kindness with Maya became more and more forever gone.” The final illustration shows Chloe in a lush, lovely pond side spot. The beauty contrasts with Chloe’s uncomfortable realization that it is too late to make amends for her ugly treatment of Maya. The reader feels the weight of that understanding. There is no and-she became-Maya’s-best-friend easy answer. The message is clear. Sometimes, do-overs are not possible. We—adults and children—must choose to be kind today, not tomorrow, now not later. Some mistakes and lost opportunities cannot be corrected. Our choices matter.